Here what our clients have to say! Jack and Lana were one of the best decisions we made for our entire wedding!! From the first time, we met them they saw a vision for us and listened to our needs and wants for pictures. They included an engagement photo session in our package, and as soon as we saw the pictures, we knew we made the right decision. I would not consider myself a photogenic person by any means, and Lana made my husband and I look like supermodels! At the wedding, she and Jack worked with us to coordinate the day, and they made everything so easy! They captured the essence of our relationship, and I never felt like the shots looked posed or awkward. After seeing our gorgeous wedding pictures my husband and I are having a difficult time only choosing the ones we want to put in our album! Long story short, book with Jack and Lana, you will be happy you did!!! Lana worked incredibly hard and got every possible shot of my daughter’s wedding last week in Groton. She even froze outside in 48-degree weather…She has very reasonable pricing as well…I highly recommend her for your wedding day! New England Wedding photographers Jack and Lana are a must have for your special day. They will capture all the special moments that you can cherish always. My experience with Lana and Jack was amazing and when I met them for the first time I knew I wanted them as my photographers. They are wonderful, sweet people who have a love for what they do. Their work speaks for itself, It is absolutely incredible. We absolutely loved working with Jack and Lana! They met us at our wedding venue prior to booking them so that we could peruse the grounds together and chat. Leading up to the wedding day, communication was great. On the actual wedding day, it was fabulous to have Lana with the ladies and Jack with the gents- we both got really great “getting ready” photos because they work as a team! Jack and Lana work very well together and keep the photographing moving right along at a comfortable pace. They are relaxed and have really good suggestions. I was blown away by the quality of the photos and the level of detail that they captured on that day. I especially enjoyed doing the first look- we each went with one photographer in separate cars to a downtown park/gazebo and took some photos prior to the ceremony. It was a very nice, relaxing moment. I also liked the late-night photo shoot in the rain with the clear umbrella. They bring plenty of equipment to make the photos look magical, such as a light that they positioned behind my dress so it created shadows/light in the night time. I can’t wait to see the wedding album that they are putting together. Thank you, Jack and Lana! Jack and Lana are not only amazing photographers but amazing people. We couldn’t be happier with everything from meeting with them to the final wedding photos. They really took the time to get to know us and made sure they captured our special day. They were very creative with the engagement photos and have a great eye to make a good shot great. My husband and I tied the knot on 2/11/2017 at the Common Man Inn and Spa and New England Weddings was there to photograph the happiest day of our lives so far and they did not disappoint. The photos are beautiful and well executed! Jack and Lana are professional, focused and easy going. They helped us fine tune the vision we had for our photos and provided input on concepts and ideas that transformed our photos above and beyond our expectations! Jack and Lana were recommended by my best friend after they did her wedding. I am so impressed and I would certainly recommend them for any moment you wish to have captured with high quality photography. Lana and Jack are a team that you should definitely have photograph your wedding! They work together so well and capture both classic and artistic shots. Before our wedding, we did an engagement shoot with them, which were some of the most amazing nature shots we had ever seen! They have an eye for good shots. But most importantly, they are super fun and easy to work with – people you would want to have at your wedding as guests if they weren’t taking photographs! I knew from the moment I met Lana and Jack that they were the perfect photographer’s to capture my wedding day. They were so warm and welcoming, they invited my parents, myself, and my husband to their own home for our first meeting. I was immediately impressed by the quality of the wedding albums they showed us as samples. Each page was elegant, refined, and timeless. The dedication and artistry this power couple invest in their photography business was very evident in our meeting and on my wedding day. Many weddings I have attended, I have felt the photographers detracted from moments of the ceremony or celebration, in attempts to get perfect pictures. Lana and Jack added to our day, and not for one minute did they feel distracting or intrusive. They naturally facilitated picture perfect shots, and naturally captured hundreds of candid moments of joy. The photos they took of me and my husband on the beach will forever be some of my favorite photos and memories of the two of us together. I highly recommend working with New England Weddings Photography and am so thankful I was able to work with them! Lana and Jack photographed my wedding this past June and were all I could have asked for and more! They were so attentive and caring from the beginning of our experience until the end. My husband and I are from out of state and Lana and Jack went out of their way to accommodate our dates for the complimentary save the date photo shoot and were with us the entire day of the wedding from the moment we started getting ready until the dancing at the reception was done- over 10 hours! Because you get two photographers, Jack spend the day with my husband and his groomsmen getting great shots while Lana was with me and the girls. We didn’t have to choose what pre-ceremony shots we got or do any running around. I honestly cannot say enough good things about this couple- their services are worth so much more than they charge. The photographs are amazing and I am so happy with our experience. Thank you so much, L&J! Jack and Lana are amazing! From the first meeting, we knew they were the photographers for us. They are experienced, easy going and very versatile! Everything we asked of them they went above and beyond. All of our guests commented on how wonderful our photographers were. I can’t wait to see the rest of our photos, but from the previews I can already tell they will all be amazing. You captured the heart and love of our day with such ease and I can’t thank you enough! We will be using Jack and Lana for all events moving forward! What an amazing experience we had with New England Weddings. I am so happy that for our wedding we chose Jack and Lana as our photographers. They spent an entire day with us and photographed everything from little detail to the most precious moments. Their vision matched exactly with what we were looking for in our wedding photos. The Italian photo album we received as a part of the package was absolutely breathtaking. Lana and Jack did an incredible job arranging photos for the album so that it looks flawless and overall magical. This husband and wife team are wonderful to work with. They listen to their couples, and try to do everything to capture everything that is important to a couple. They are fun, easy to work with and very accommodating. They have excellent equipment and solid understanding of photography. What I liked the most is their creativity and not being afraid to suggest shots that may be out of comfort zone or new for a couple. At least for me, shots recommended by Lana and Jack came out absolutely gorgeous and I am thankful for their recommendation. I highly recommend this great team of photographers. Not only will you have fun during your photoshoots but also a piece of mind that you are in great hands and can expect an exceptional job from these guys. Get ready for an AWE moment when you see your pictures!!! Thank you Jack and Lana. Jack and Lana were BEYOND amazing. We decided to contract with them for our wedding after we spent about 5 minutes working with them at a family member’s wedding. They are FUN and super accommodating, totally laid back, very quick with their edits and return of the finished product, ridiculously affordable, and just INCREDIBLY good at what they do all the way around. I’ve heard multiple people say in the past that you really only need a few good shots of your wedding to make your photographer worth it…well, we ended up with WAY more than a few AMAZING shots. They naturally framed so many shots beautifully, they have an incredible knowledge of how light works and how to manipulate it to produce absolutely breathtaking photos, and they had so many useful and clever little tricks to help us get great pictures every time. We were SO pleased with Jack and Lana’s professionalism, skill, and ease to work with, that we’ve discussed booking a few other sessions with them in the future, and we’ve already used them since our wedding to take Christmas pictures of our dogs (because we’re weird dog people like that) and those came out FANTASTIC! Seriously…call them. It was lovely to have Lana and Jack as part of my daughter’s wedding. Their calm, low-key presence was much appreciated. Their photo booth look is very modern and upscale compared to others I have seen. Jack and Lana are the best! We can’t say enough about how great they are. Not only are they amazing photographers but also a great couple. Very friendly, fun, and energetic!! Our pictures are more than I ever could have hoped for, flawless. The day went by so fast but they paid attention to every detail and made sure to capture every moment. Everyone at our wedding told us what an amazing job they did. I will definitely recommend them to anyone I know getting married. New England Weddings was such a pleasure to work with. Jack and Lana are the perfect team. They met with us multiple times before the wedding in order to help us plan and prepare. They even showed us a couple of good poses to use while dancing! You won’t find a more creative and talented couple to take your photos. They worked with us throughout the day of the wedding, recording both the bridesmaids and the groomsmen getting ready. 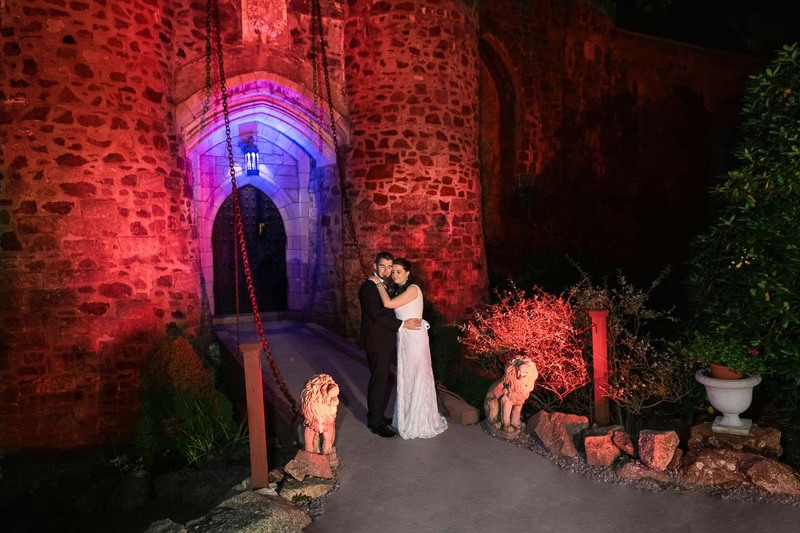 After the ceremony, we met them at Bancroft castle and took some beautiful photos of my husband and I. Jack and Lana utilized the outdoor lighting and romantic setting to take some truly exquisite photos. They were able to keep us organized throughout the whirlwind of the day and get great group photos with our bridal party and relatives as well. Throughout the evening Jack and Lana continued to take beautiful candid photos of our guests as we celebrated! 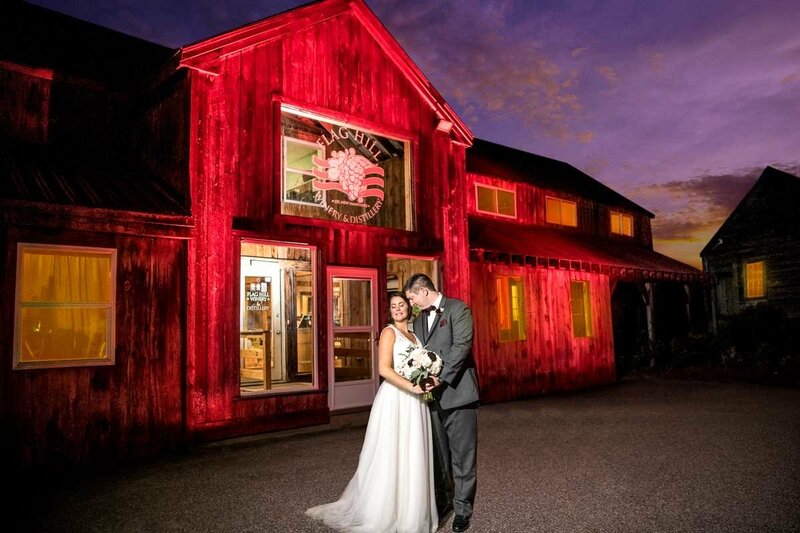 New England Weddings also set up a beautiful night shot outside of our venue! They even took some gorgeous close ups of the bouquets and bridal accessories like the wedding rings and earrings I was wearing that day. I can’t complement Jack and Lana enough for the amazing work they did for us! Thank you for helping us to remember our wedding through such beautiful photographs! They were perfect!!! They were amazing!! !Everything was great!!!! Lana was amazing! She was so much fun, and sweet, and super patient with our wandering wedding party. She went in early and took shots of my gown, flowers, rings, and venue. She made sure we had every shot we wanted and included anyone we wanted photos with outside of the traditional family and wedding party. She is now designing our album based on our favorite photos which she individually edited. She included different versions of photos with various colors and filters so we can pick our favorite. You can also order individual photos in any size or canvas. I can’t say enough great things about her. 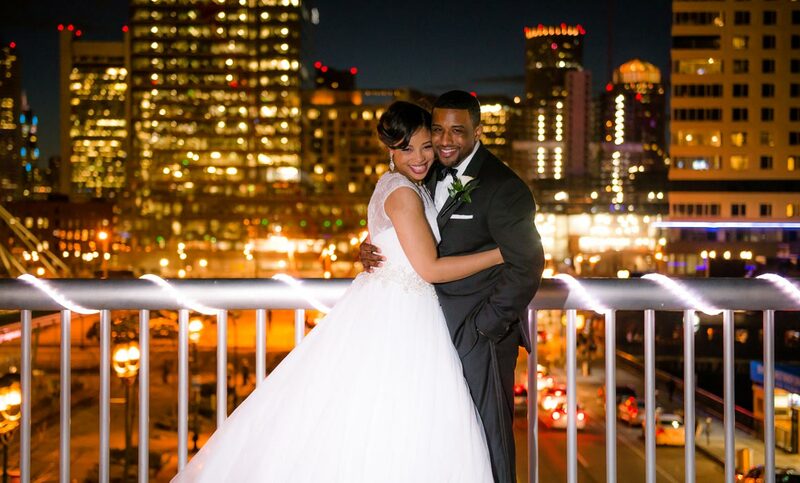 We are forever grateful that she memorialized our perfect day! ? Jack and Lana were incredible. Could not have been happier! They took the time to understand what we were looking for and achieved that and more. Our wedding pictures are amazing! There are no second chances with wedding photography and we are so grateful we went with New England Weddings for our daughter’s wedding in June. Lana & Jack are talented, artistic, creative and capture the memories of your special day, all while making you feel comfortable and relaxed. From the time we first contacted them until the gorgeous wedding album was in our hands, Lana & Jack were warm, attentive and professional. Every photo told the story of the day and was captured in an unobtrusive way. Reasonably priced, you get so much more from this talented, friendly duo than you would from a single photographer as they work together flawlessly. We cannot recommend them enough! We hired photographers and ended up with friends. We are getting married in May , she had meet them and by the end of our engagement shoot we were quite comfortable . I can’t wait to see what they have in store for our big day! Thanks again Lena and Jack ! It was great they were on time and informed. Made us so comfortable taking pictures love them The pictures were amazing! Lana & Jack are a great team. Very friendly and professional. We are glad we met them and that they took our engagement and wedding pictures. They came out awesome! We will recommend them to everyone we know and we will continue to have them as our photographers throughout life events. Thank you so much for making my day PERFECT! You guys are the best! Lana and jack were referred to us by a friend to take our wedding pictures. From the outset they were a delightful couple to work with and they made our day very bright and enjoyable. Lana and Jack are very professional but also very fun. We were VERY happy when we received the photos of our wedding – the composition and quality of work were top notch. The pictures had a very natural elegance and simplicity that we really loved. If you are looking for a wedding photographer I absolutely recommend that you speak with Lana and Jack! I would recommend Jack and Lana to anyone who is looking for a great photography team!! My husband and I got married on September 20, 2014. Lana and jack were there for us from day one. With planning on how we were going to take the pictures so they would come out just right , to reminding me to BREATH during the wedding. They are a wonderful team and I highly recommend them to anyone who wants breathtaking photos! They go above and beyond any expectation you may have. They are truly fantastic people. We love them!! Lana and Jack shot my wedding @ the Colonial Hotel in Gardner Ma. We were more than impressed with their services!!! They were AMAZING!!! They went above and beyond with the whole processes, from are first meeting to the last!!!! The quality of work was OUTSTANDING we couldn’t ask for more beautiful wedding photos!! Thank you so much Lana & Jack for the most beautiful wedding photos!!!! Lana and Jack are what made our day perfect! There were every when we needed them and captured moments we didn’t even know happened! They are a perfect team and always knows where the other is. My dad who is also a photographer even said the photos were truly amazing! I Couldn’t have asked for a better photographer! A lot of our engaged friends at the wedding even asked for the names of the photographer. They have worked with our DJ many times before so it worked so well! I can not say enough about Jack and Lana. They made the entire process from the engagement photo shoot to day of portraits so much fun! They really take the time to get to know their couples so that they can capture their personalities in the photos and the photos come out amazing!